Winter season arrived with a chill. Along with it came the thoughts of escaping the Pune region and its neighbourhood Sahyadris and venture northwards. Mainly towards the Igatpuri and Nashik regions. Many avid trekkers have waxed eloquent about the mountains in this area, and particularly those around the Bhandardara dam. We started on Friday night at around 11:30 PM. The plan was to reach Baari village, the base of Kalsubai and the starting point of one of the best known routes, in about 5-6 hours and rest wherever we could before starting the trek. 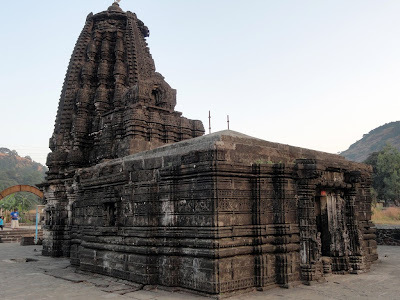 What with nobody knowing the exact route and the over-confidant driver enacting as if he is driving a sports car, and the curvy mountain roads, we landed in another village called Shendi. Shendi is slightly towards south of Baari (about 10-15 km). At roughly 5:00/5:30 AM, we just parked the bus in what looked like the village square and slept in the bus. An hour or so later, we woke up, had tea breakfast and after finding about the exact route to Baari, moved on. 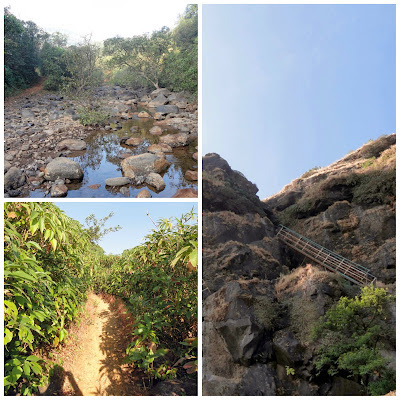 Before reaching Baari/Bari, there is a board near Pendshet that announces the easiest route to Kalsubai (This was nowhere mentioned on any blogs so we were sceptical). The local villagers from Baari later told us that this was just a political ploy by the administrators or the villagers from Pendshet. So, if you do go, avoid that route. 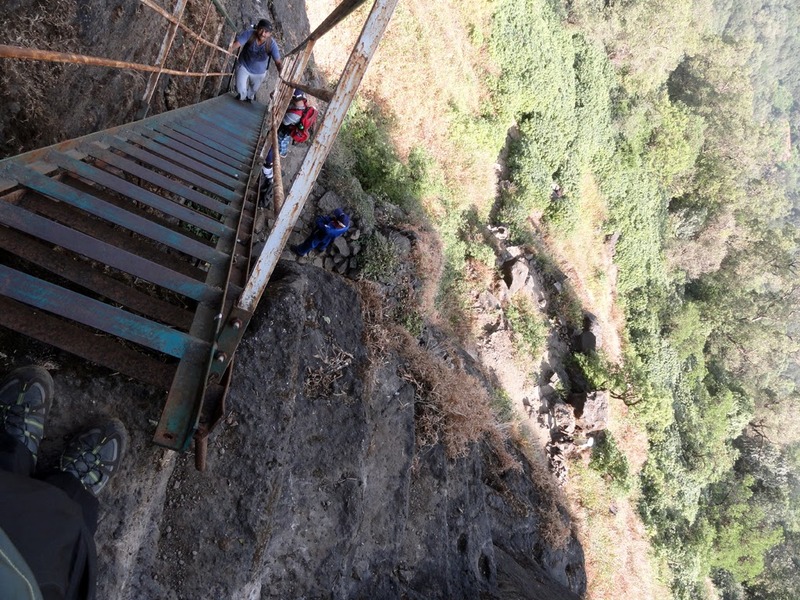 After reaching Baari we got set and began the trek. 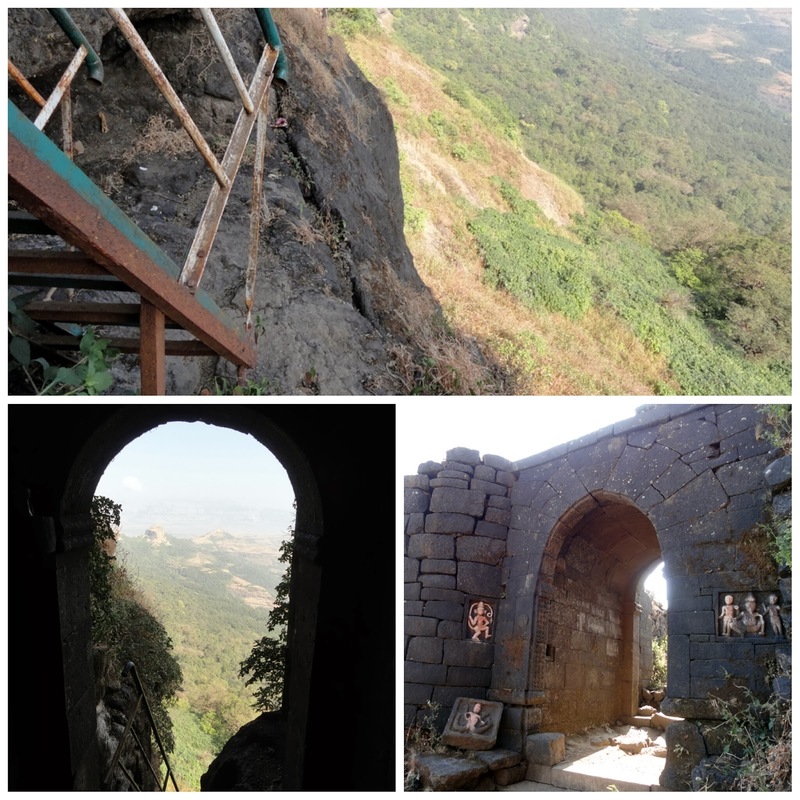 Kalsubai, even though the highest peak in Maharashtra, is not the highest climb. The route continuously ascends but is not difficult. Trek begins towards the Kalsubai peak hidden behind a cloud. At around 30% mark, there are metal ladders along the path. While some of them are rickety, they do not seem that dangerous! Some of us thought that we should reach the top after we climb the ladders, but that was just 50% of the route. More walking! Beyond ladders. 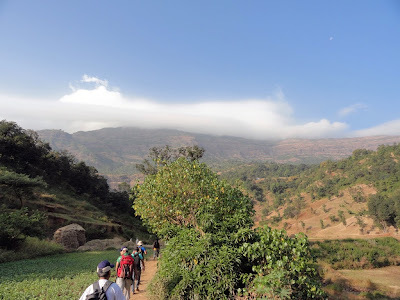 Kalsubai is the second peak from the left. 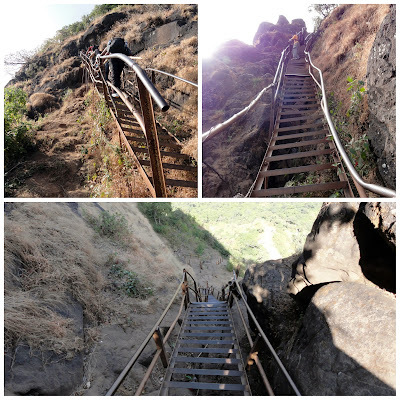 Towards the end, there another long ladder that takes you the highest point where the Kalsubai temple is located. This place is filled with people resting after the long trek. There were some refreshments and I gulped down two glasses of Taak / Chaas made from the local buffalo's milk. 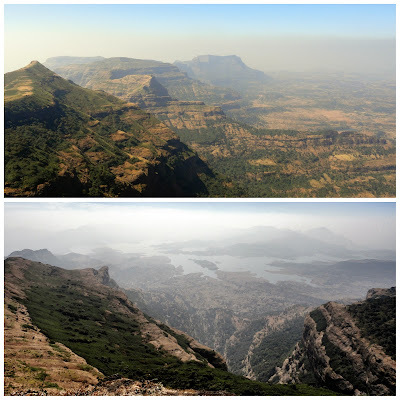 I also opened up Harish Kapadia's wonderful book "Trek the Sahyadris" and tried to point the several mountains based on the neat maps from the book. The weather was a bit foggy and some of the mountains were partially hidden. After waiting for a while, we started our journey back and had lunch en route before boarding the bus. From Baari, our bus took us back to Shendi, and then via Bhandardara dam, we reached that quaint little village called Ratanwadi. Ratanwadi is know for Amruteshwar Mandir. I was really impressed by the clean village. We loitered around Amruteshwar Mandir and the village and then had the usual fare of local poli-bhaaji-varan-bhaat dinner served by one of the locals. That dinner was the amazingly satisfying for our tired body and minds. Since we were a small group, we decided to sleep in the verandah of a local house. The same kind people who had served us dinner and were going to be our hosts. Early morning on the second day, we started moving towards Ratangad. It is a scenic route that takes you along a brook, forests and then another set of ladders. 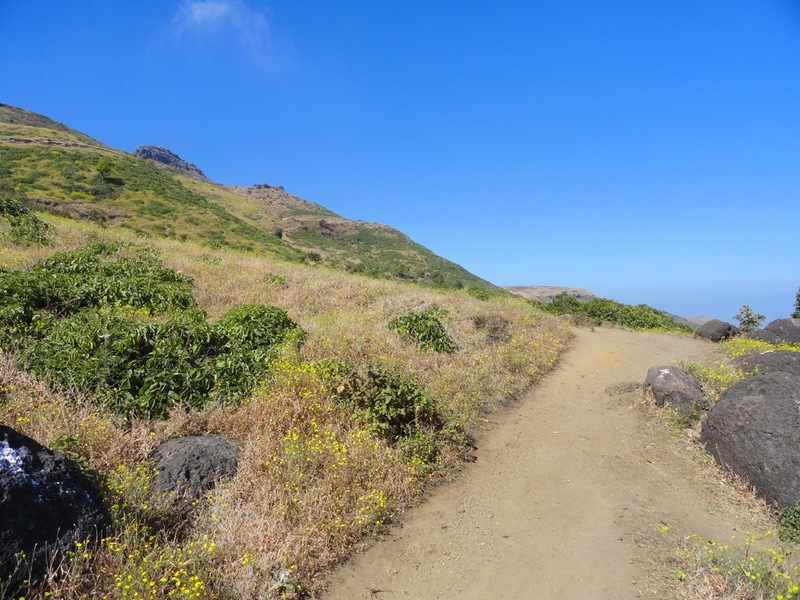 This definitely is one of the beautiful trekking routes I've come across so far. It's pleasing to the eye, shades you from the sun, and broadcasts the lovely sounds of birds. On reaching the ladders, you'll see that there are stone cut steps as well besides the ladders. Ladder on the left, steps on the right. After climbing the ladders, we directly went to the Nedhe (Eye of the Needle) and rested there, surrendering ourselves to the surrounding splendid panorama. 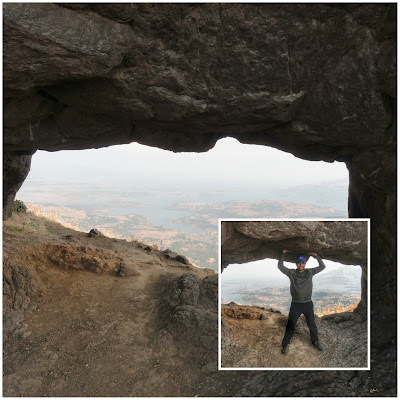 From the Nedhe you have a commandeering view of the Bhandardara dam region. Must be a good spot for the soldiers to scout. After spending some time and gulping some food, we started back. Completing our double trek.